ANTHEM's got its second in-depth pre-release trailer, this time highlighting the activities and rewards of the title's endgame content. It goes pretty much how you'd expect: you hit max level, finish the story, and you're free to put your skills to the test in a number of challenges, special missions, and co-op Strongholds. The tougher the fight, the better chance of good loot. 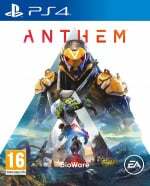 With just a couple of weeks to go until ANTHEM's launch on the 22nd February, it'll be interesting to see how the game holds up. After all, this is developer BioWare's first shot at this kind of live title. Do you have high hopes for ANTHEM? Customise your Javelin in the comments section below. who's hyped for metro exodus? I get that end game is important but it's all anyone talks about with these games. What about the stuff leading up to the end game? Had really high hopes but after the beta, I’ll be holding off on some reviews. Not sure what happened at BioWare, maybe some talent left for other studios, but for me they peaked at Mass Effect 2 and have been slipping since. Fingers crossed though. VIP Demo was a disaster. Public demo worked fine but my real worry would be a lack of end game content. The only really meaningful end game events are the 3 strongholds, which is such a low number. I'd of been hoping for at least double that. The endgame is going to consist of replaying the same 3 strongholds over and over again, to get the better gear to replay the same stronghold at GM2 and GM3. I'm all for grind, I'm happy to grind if there is enough varied content to grind within. In the video is he mentions they will add some more contracts (really easy, like adding new dailies in Destiny, but not really considered meaningful content) and some times events. He does not mention new strongholds or areas to explore. The world will feel really small really quick. There is no paid DLC and if the Live Service is anything like the Battlefield 5 Live Service then it basically means ZERO. The odd skin drip fed here or there. Also, not that I'm arsed about cosmetics, but it is £20 to purchase a new skin for a Javalin or around 1,000 hours of grind. Please release a road map. I got sent an email from EA yesterday asking to fill out a quick survey about Anthem. I haven't done it yet, I only played it fro about half an hour. If it actually functions and there's a good amount of content I'll buy it, but I have very little faith it will. @youreyesonly00 extremely hyped. Never played them but that ‘uncovered’ trailer woke me to a game I somehow missed through the years. Planning on playing Redux to catch up before next week. I hope it turns out well but I’m expecting a vanilla Destiny amount of content. "this is developer BioWare's first shot at this kind of live title." Are we not counting the still active SWTOR? Yes it's going to have problem's at launch mainly server issues, the Demo was quite unstable but hopefully its helped for the 22nd launch. I actually think the staggered release is the best option for online games like this, instead of hundreds of thousands of players trying to play at once. I didn't feel the game is ready yet. Lots of quality of life changes are needed from ui to map system. It was fun but I will wait 6 months to see how the content and micro transactions play out. there is no 20 quid skin.